When author, Tina McFadden, contacted us about her new book, Elffolk and the Crystal Caves of Atlantis, I was honored at the privilege of reading it to my children before it was released. I jumped at the chance, and have to say, my family and I LOVED the book! My children were captivated by elves, Nissa and Enna, and their adventures through an enchanted world filled with fantasy and even a talking cat, named Mica, who by the way, is my oldest son’s favorite character. If you’re looking for a whimsical tale to whet your children’s appetites for fantasy fiction novels, you HAVE to have this book. The imagery of both the world and its characters is simply spell-binding and the story is loaded with the inspiring message that challenges aren’t barriers, they’re obstacles which can be overcome. 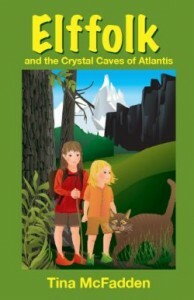 I’m excited to announce that Elffolk and the Crystal Caves of Atlantis is available for sale starting today! Order it online now! Tina was also gracious enough to provide Advice For Parenting with an autographed copy of her book to giveaway to one of our readers! The contest ends at 11:59 p.m. PST on Sunday, August 29, 2010, so enter right away. To enter, simply leave a comment below, telling us what your favorite children’s book is and why! I will be selecting a winner through a number draw on Random.org. Good luck and happy reading!!! Jessi Arias-Cooper is the senior writer and an editor for Advice4Parenting.com. She is a work-from-home mother of 3 boys and has been married for 10 years. If she had time for hobbies and interests outside of parenting and keeping house, they would be jewelry making, baking, watching bad B-movie horror flicks and creative writing . If you have a question for Jessi, click here. Ask Jessi: Will I Be a Good Parent? Our favorite children’s book (since we are still in board books) is Snuggle Puppy by Sandra Boynton. It is very “suess-ish” but also conveys the love that a parent has for their child! Our favourite book is “William, Won’t You Wash Your Hands”… I can’t remember the author because we packed it away in somebox (moving in a few days) … Email me later if you would the author of the book! Our favourite is The Gruffalo although I’ve written a couple of kids stories I’m also a little partial to! i need mo re suggestions to read to my 4 yr old. we have some Dr. Suess books but i want to read her more than just those. MY favorite childrens book of all time is Where the Wild Things Are. I love it because of the magic it holds and the meaning it tells. It never gets old. Great giveaway!